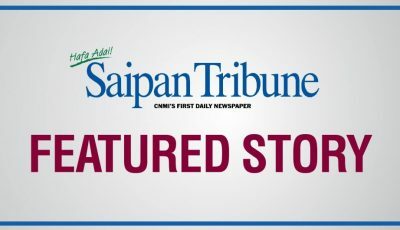 More areas on Saipan now have electric power as two more feeder grids are partially online, in addition to Feeder 1, which was the first to be energized, according to Commonwealth Utilities Corp. yesterday. As this developed, CUC executive director Gary P. Camacho said that utility companies in Kosrae, Pohnpei, Chuuk, and Palau have offered the help of more linemen and they are now coordinating this. Line crew from Rota CUC and Guam Power Authority are currently on Saipan, assisting with power restoration. GPA linemen were seen working with the power poles and lines going up As Terlaje yesterday. 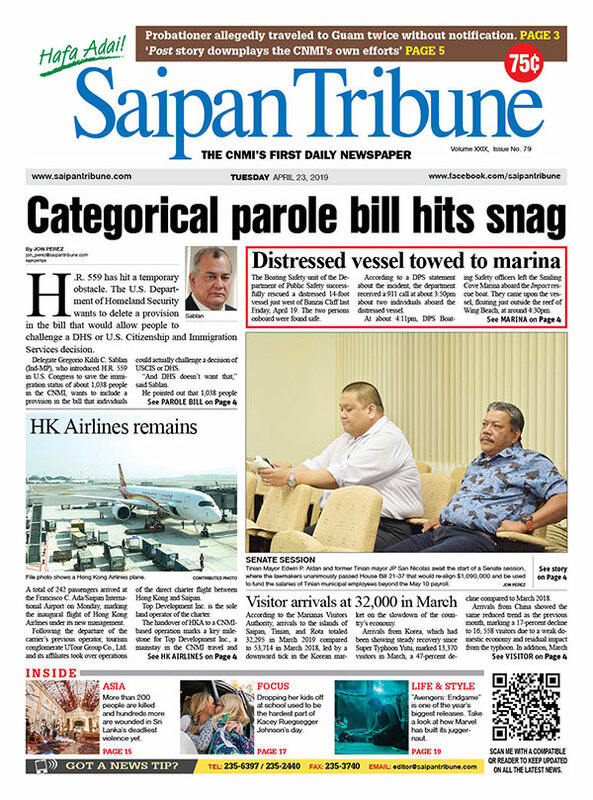 On Saipan, as of yesterday at 2pm, 913 poles were down and damaged, with 510 damaged transformers. On Tinian, as of yesterday at 2pm, all feeders remain offline, but station power is on at the CUC Tinian Power Plant from 6am to 6pm. Islandwide water service remains offline. A total of 16 water line damage have been repaired. Of the nine feeders on Saipan, Feeder 1, Feeder 4, and Feeder 7 are now partially online or have power. Under Feeder 4, five power poles going up Capital Hill, with certain areas from Lower Base to the Capital Hill intersection before the post office, now have power, according to CUC executive director Camacho. Under Feeder 7, the areas in Sadog Tasi, Puerto Rico, and Marpi have power, along with certain laterals of the Northern Marianas Trade Institute, transit bus station, Tanapag Mobil, Tanapag school, the Saipan Ice and Water Co., San Roque Fire Station, San Roque Church, and certain As Matuis laterals. 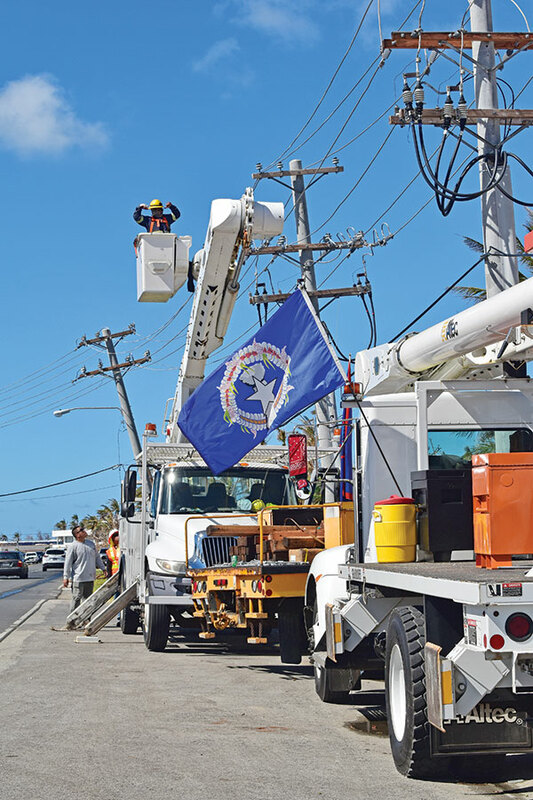 The first to have power were Feeder 1 primary lines or the Commonwealth Healthcare Corp. area and adjoining laterals, which were energized last Oct. 28. The following day and succeeding days, other areas under Feeder 1 were also energized. 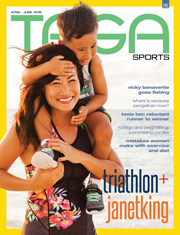 The areas are Anak’s, lower and upper Navy Hill, lower MIHA, Paganville, Sugar King Estates, Bank of Saipan to China Town primary lines, JG Sablan and Water Company, west of Bank of Guam to Garapan Elementary School, 99 Cents Store, Lower Base, Sadog Tasi Treatment Plant, Puerto Rico, and across Garapan Central Park. The grids that have no power as yet are Feeders 2, 3, Kiya 1, Kiya 2, Kiya 3, and Kiya 4. For Feeder 2, Camacho said downed power poles and fallen transformers have been removed and cleared from Micro Beach Garapan to Atkins Kroll. CUC also completed the assessment of downed transformers from CUC Oleai to Micro Beach, Garapan Central Park to Payless Shoe Store. For Feeder 3, Camacho said the electrical systems of certain water wells in Gualo Rai have been repaired and are ready for generator installations and connections. For Kiya 1, CUC installed a total of 29 wooden power poles from the Chalan Kiya substation going up As Terlaje. CUC installed 16 power poles on Airport Road and continues erecting poles throughout, including 36 more poles to Isley Field. For Kiya 2, Camacho said four water wells are ready but crew continues to clear downed power poles and lines in Dandan and Obyan areas. For Kiya 3, downed power poles and fallen transformers have been removed and cleared from Payless Store to J’s Restaurant. The collection of damaged transformers and removal of hardware and conductors from Eucon to Sugar King have been completed. For Kiya 4, downed power poles and hardware have been cleared and removed at Mt. Carmel Cathedral and the Gilbert Ada Gymnasium areas. Camacho said there is an ongoing clearing of downed power poles, transformers, and conductors from Susupe to Chalan Kanoa Texas Road. On water updates, Camacho said while emergency generators are hooked up and power is restored and crews have performed repairs, only five out of six water filling stations are available to the public until further notice. The remaining five water filling stations will increase their volume of supply to 100 gallons. The CUC Customer Center in Dandan opened over the weekend. The CUC Customer Center will also be open today, Monday, from 8am to 5pm.